I used to store my wine bottles haphazardly in the cardboard boxes that they came in. But I got tired of wasting time rummaging through my collection looking for a particular bottle. That was when I decided to look for a good wine rack to put order to my wine bottles. 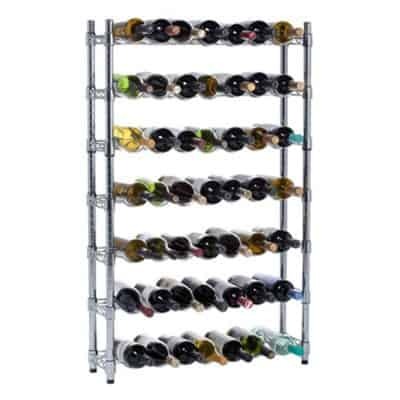 If you are increasing your wine collection, you need to look for a large rack. Or perhaps a wine rack integrated into a piece of furniture. 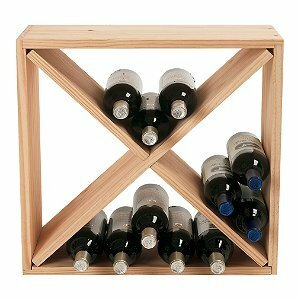 If you only buy wine occasionally, then a small rack may be perfect for you. You can choose between a vertical or horizontal wine rack, so consider the amount of space you have before you buy a rack. 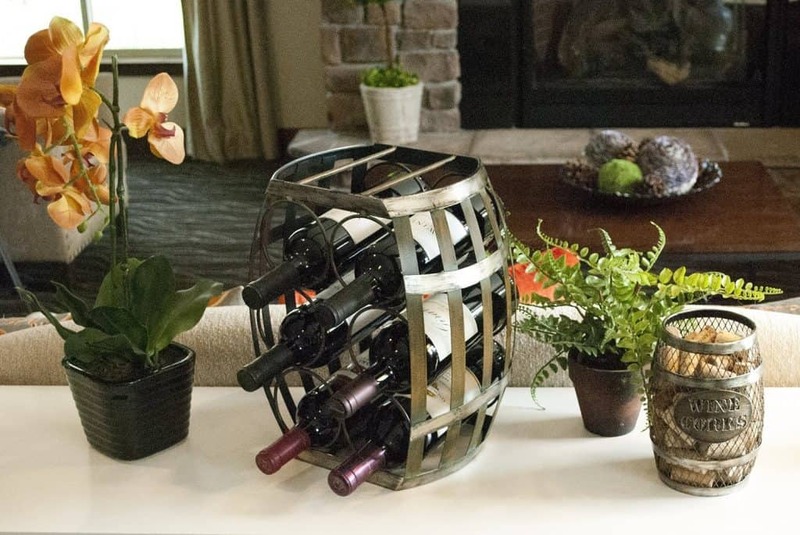 Will you use your metal wine racks for decoration or storage? No matter what style of wine rack you choose, you will need to store your wine in the right environment. Keeping this in your mind will help you choose the right spot in your home. Proper storage will allow wines to maintain their taste and flavor over many years. Improper storage can ruin your wine, leading to a sour or vinegar taste and smell. Do not store wine in a hot and humid environment. Pick a place that’s dry and cool. Also, don’t store wine beside a machine that generates heat that will abruptly end a wine’s maturing process. 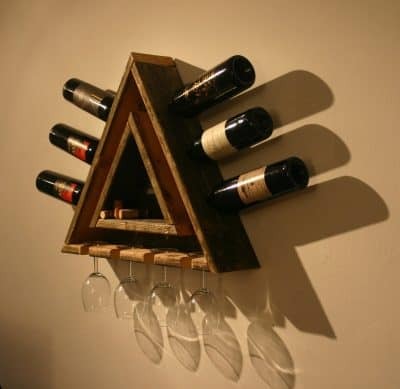 Ok, so you came here for wine rack ideas. Let’s start off by materials, metal and wood. Then we’ll look at some racks specific to placement and then style. Metal wine racks are a perfect selection when you’re hunting for a safe and secure home for your wines. Not only are they great to store your treasured wine bottles but they are also a stylish conversation piece for your dining area. 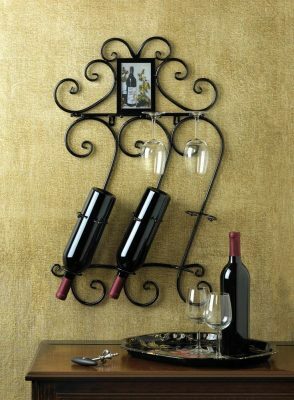 Metal wine racks can be formed into beautiful artistic pieces. 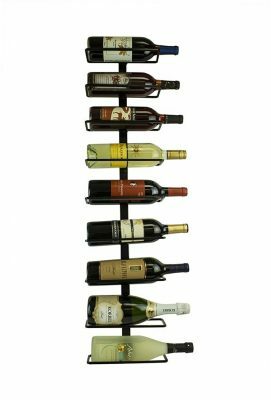 There are beautiful and trendy metal rack designs to choose from and to display your wine collection, here are some of the most popular. 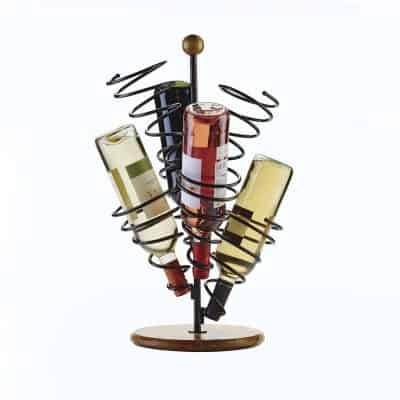 When I started collecting wine, I immediately started looking for wire wine racks to store my bottles. 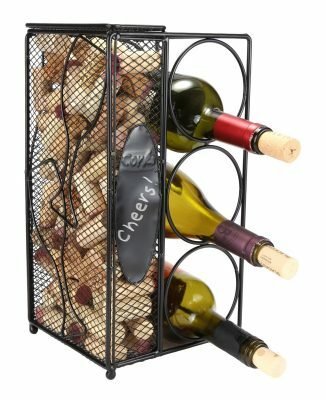 There are so many wine rack styles to choose from, which made my search rather hard. I chose wire racks because they look so visually appealing. 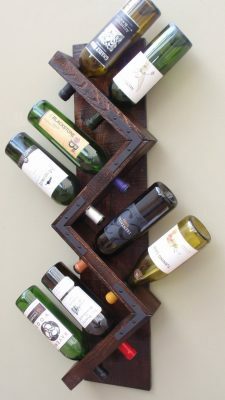 Most wine racks I see in other people’s homes are made of wood. I have only seen a few that are made of metal. I personally like how wire racks look sturdy. It is important to thoroughly check the construction of any wire wine racks you consider. I want to make sure that the staples are strong and stable enough to support the bottle holders. I don’t want them to buckle after a while. The thickness of the wire pieces should also be inspected especially since I intend to keep my collection for many years. My wine racks are for long-term heavy use so I need to make sure that everything is attached or nailed together to achieve maximum stability. Luckily, I found wine racks that are made out of cold rolled steel. It is coated with a baked finish that protects the material from rust and chipping. I would happily shell more money if it means having good quality wine racks. I would never go for inferior quality even if it means they are cheaper. I would probably be worried that they might fall apart at any minute. 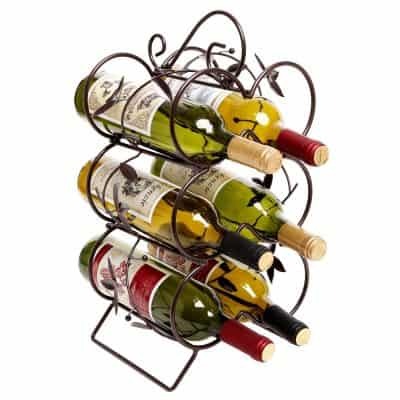 Wrought iron wine racks are commonly seen in the homes of those who enjoy wine once in a while. Although not all households own one, they do offer some benefits. They also have some disadvantages but the positives outweigh the negatives. 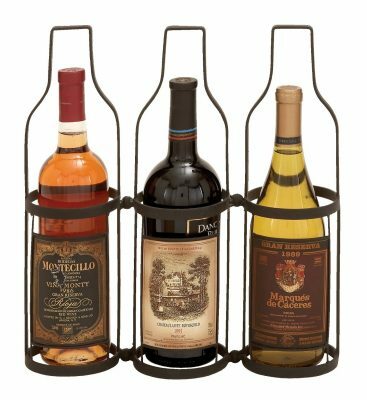 One of the top reasons homeowners are drawn to decorative wrought iron wine display racks is its durability. It is probably the sturdiest material for wine racks. Another positive thing about it is the wide range of choices when it comes to style and design. This gives you lots of freedom to find something that matches your personal style and home’s décor. The downside is they can only hold a few bottles of wine. So they aren’t the best choice for those (like me) who have a considerable number of wine bottles at home. Wrought iron is known to be a tough material. Wine racks made of wrought iron usually last for years. They can hold a great amount of weight and resist corrosion, which some other materials can’t stand. 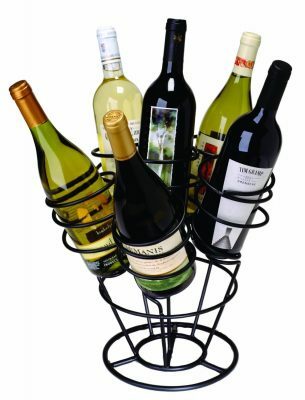 This means that wrought iron wine racks can be used either indoors or outdoors. For most wine lovers this is a desirable thing. I like how low maintenance they are. I clean mine once a month but it still looks as good now as it did a half a decade ago since I bought it. While I am one of the few who often forget to clean my wine rack, there are some who consider it a prized possession since it also serves as handsome home décor. I did not really give it a lot of thought when I was shopping for the rack. I just wanted to have something to hold a few of my bottles for when I was hosting parties. But, I saw a lot of beautifully designed wine racks. Some have abstract designs while most others are rustic and perfect for homes with Western decors. 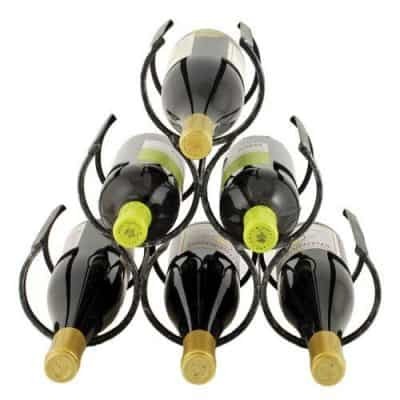 Most wrought iron wine racks I have seen can accommodate up to six wine bottles. It is enough room for most homeowners who have a few bottles in their collection. However, those who drink wine more frequently want to have more storage space. This is why I have a separate cabinet for the rest of my bottles and just use this particular wine rack for decorative purposes. This is a good choice for those who can afford it but some may consider it a waste of money especially those who do not care much about aesthetics. 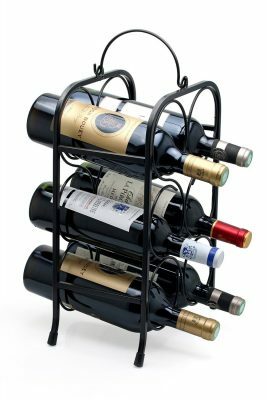 However, for the purpose of displaying beautiful wine bottles, the best material for a wine rack is definitely wrought iron. 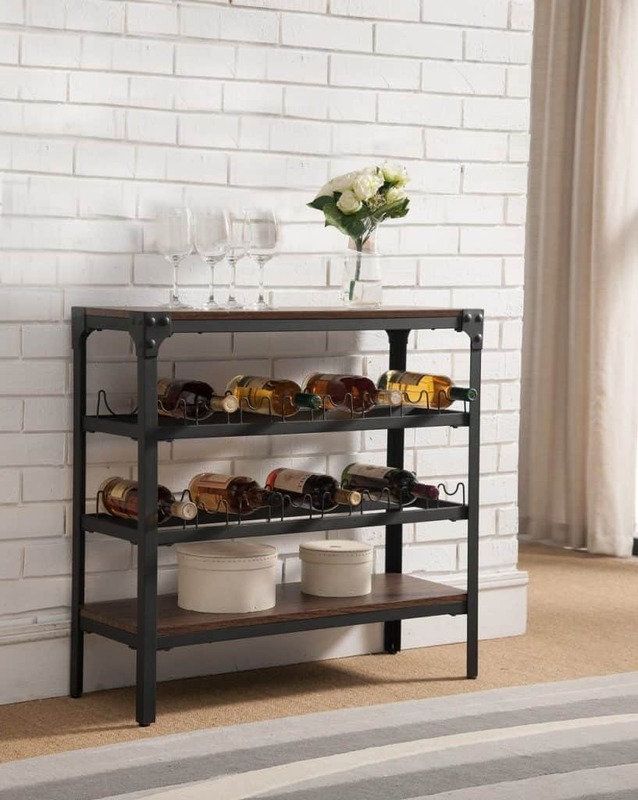 An industrial metal wine shelf is one of the best choices for large wine collections. 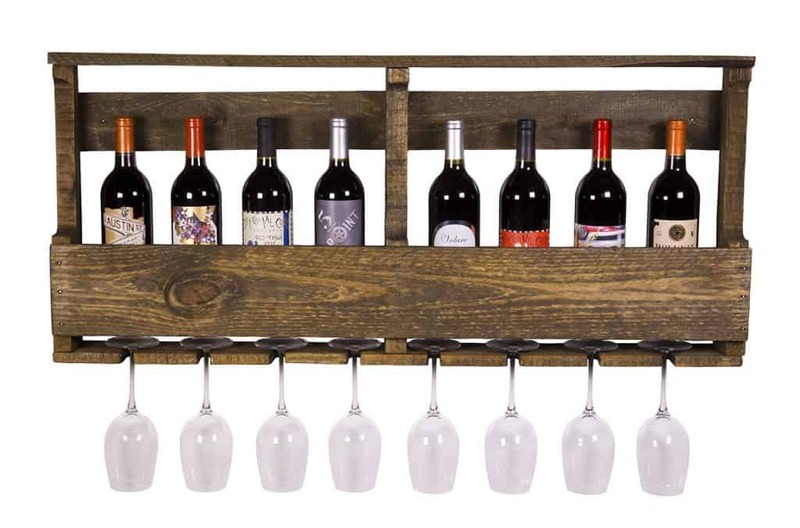 This type of wine rack is multi-layered and could house as many as 50 or more bottles of wine. 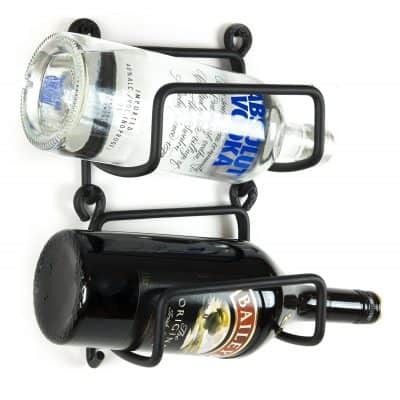 It is commonly used in hotels, restaurants, and wineries since it can hold a lot of bottles. Some industrial metal wine shelves come with casters. So your wine bottles can be transported safely from one place to another. 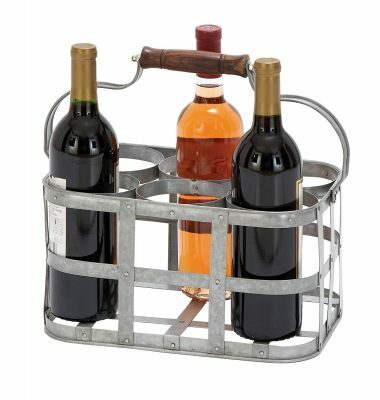 Another clever metal wine rack design is a small wine rack with a metal carrier or handle on top. 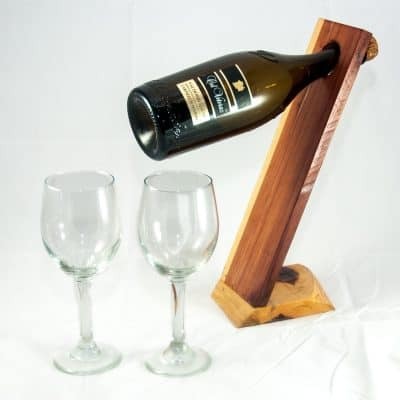 This is a gorgeous way to showcase your favorite wines. And of course, you can set it on your countertop since it is barely 2 feet tall. How about a metal counter wine rack? This is a rack that sits back in a corner or on your countertop. 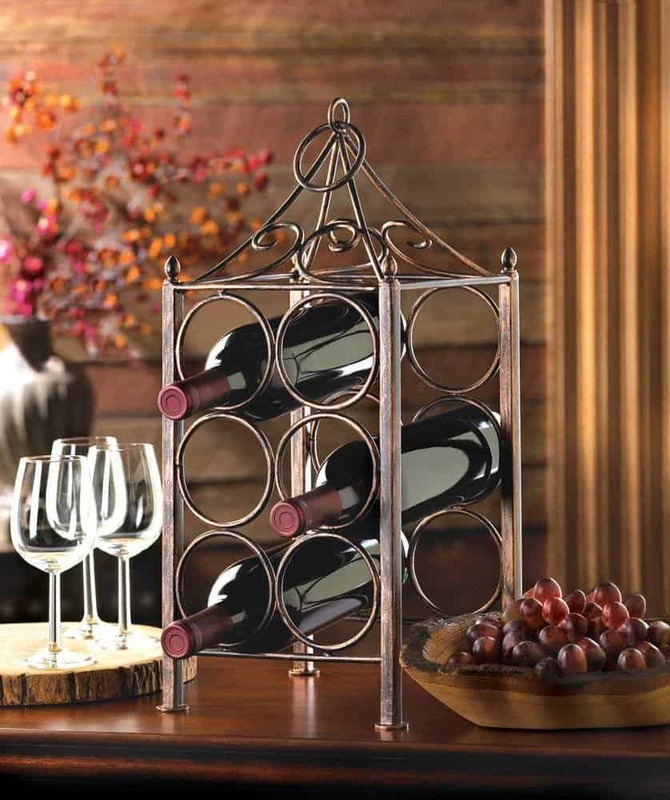 This pretty wine rack will hold 8 bottles at a time and will even handle wine glasses too. Some metal counter racks also have wheels so you can move them from one place to another if you need extra counter space. But what if you have an outrageous number of wine bottles in your collection? How do you store and display them all at the same time? A vintage wine rack would be perfect for this job. You can place wine bottles side by side so you can see the bottle information on every wine. You can also be sure that each one is safe and sound with hinges that support each bottle from the neck to the base. 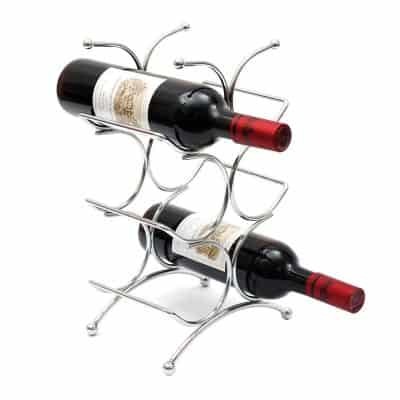 There are more metal wine rack designs to choose from. You can find racks that will suit the number of bottles you have as well as the size of the room where you will put your rack. Not only will your wine stay safe and secure, but you will also ensure it looks good too! Wine racks made of wood are the best way to store your prized wine bottles. 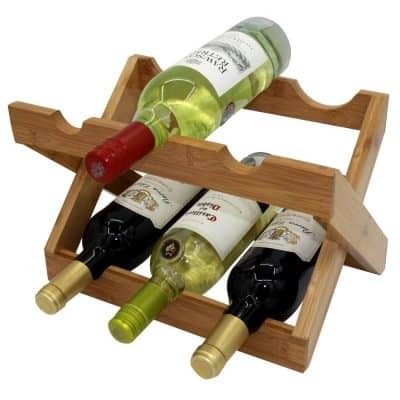 Wooden wine racks are durable and sleek. When wines are displayed in wood wine racks they look classy and romantic. 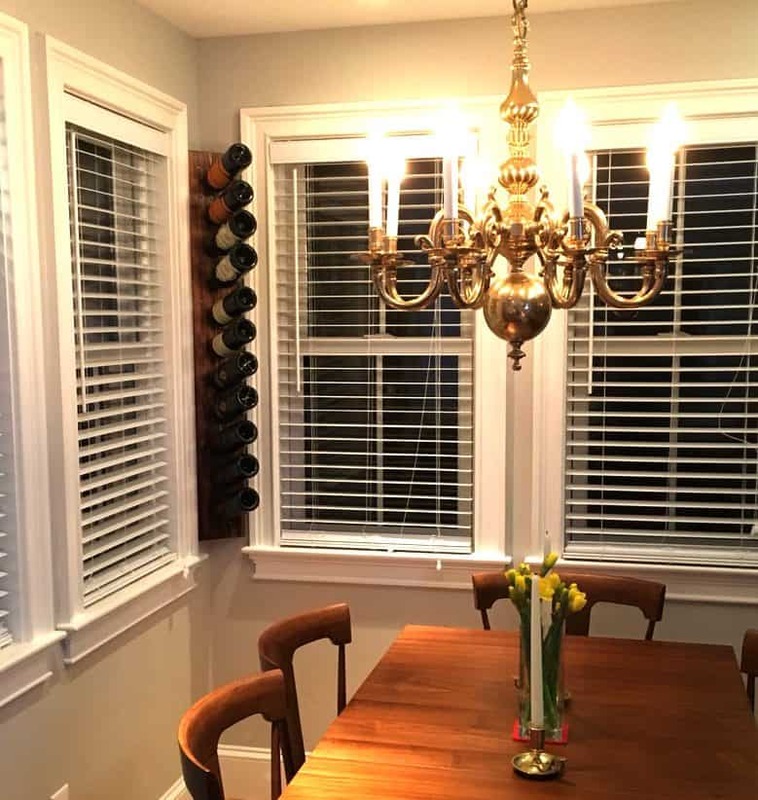 Whether the wine rack is found in the kitchen, dining room, or entertainment room, it transforms the area into something that any homeowner can be proud of. Although I have an amazing wine cooler unit, I still prefer to show off some of my wine bottles especially those that I intend to consume within a couple of months. I have seen so many wooden wine racks since I started my own wine collection. 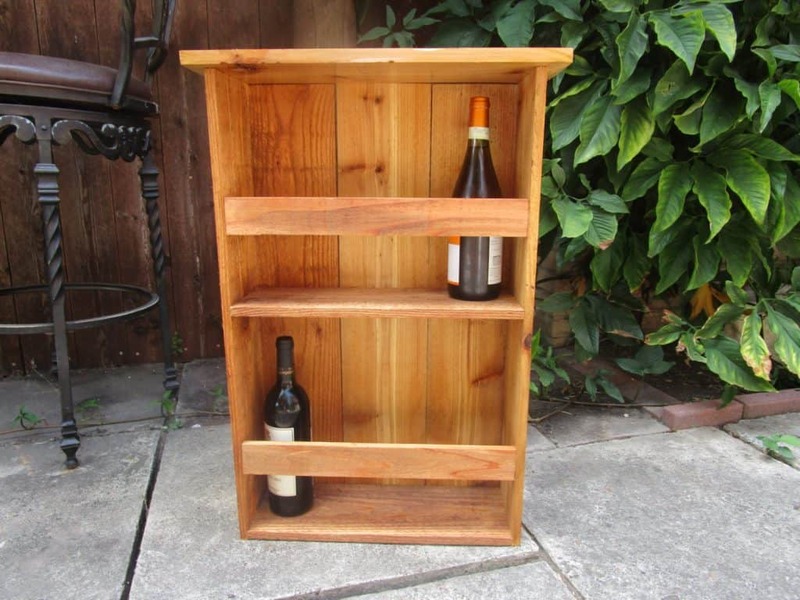 But I found that redwood is the best kind for storing wine bottles. Here are my observations. Redwood has the longest shelf life. Redwood comes from the evergreen family which has a natural preservative. It resists mildew, insects, and other elements that can lead to decay. 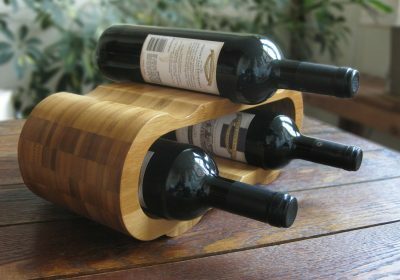 It is the most resilient wood, so wine racks made of redwood can stay with you for a long time. Redwood thrives in both humid and cold weather. Even when stored inside a warm wine cellar, it can still keep your wine in good condition. Redwood has a natural red finish. Because of this, I did not need to paint or apply an artificial finish to my wine rack. 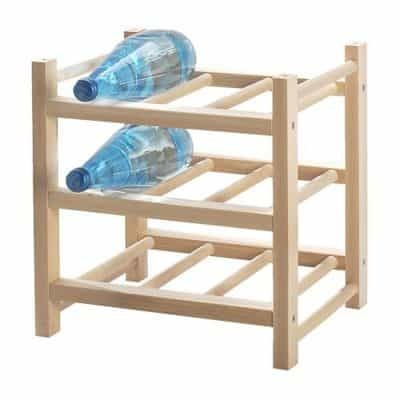 It even looks more sophisticated than other wooden wine racks I see in home improvement shops. It has been with me for more than five years now and I have noticed that it ages gracefully like wine. It used to have a bright red color but it looks darker now. It made my wine bar look more elegant than it used to. It is easy to do a DIY project with a redwood material. 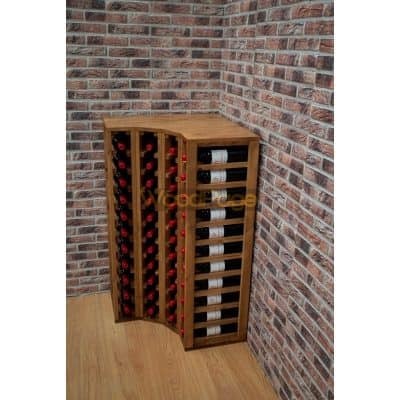 It can easily be crafted into a customized rack that will fit any size and design of wine storage areas. Because redwoods are natural raw materials I was able to create another rack that I can stack with the old wine rack as my old collection grows. Cedar is another popular type of wood connected with wine storage. Cedar is usually a dark wood that can look great with or without being painted or stained. 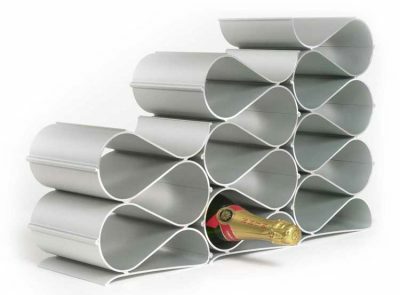 It is also very durable, so it will protect your wine collection. A common misconception about using cedar is that it will have a strong smell. But a finished cedar wood rack doesn’t have an odor, so that’s not an issue. Many bottles need a long period of time to age, so a cedar wine rack can provide the wine holding longevity your wine needs. Wood wine racks are one of the most attractive wine storage options. When choosing a wine rack for my home I consider the type of material of utmost importance. Making the wrong choice of material means compromising the safety and security of my belongings and my family. The racks holding my wine bottle should be sturdy enough so I don’t need to spend more money on future repairs. 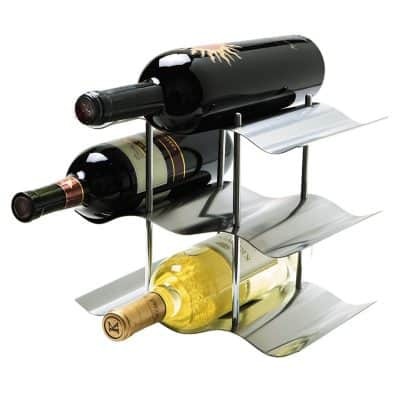 A common option for a wine rack is a metal table top style. 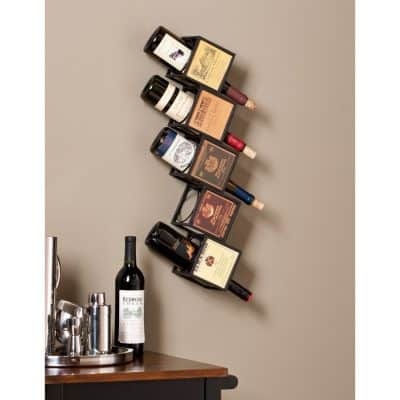 But you will discover that wall mounted wine racks are also very popular options. 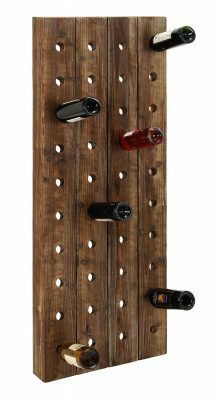 Wall Wine Racks are wine racks used to hang wine bottles in your wall. They free up valuable counter space or kitchen space especially in small homes. 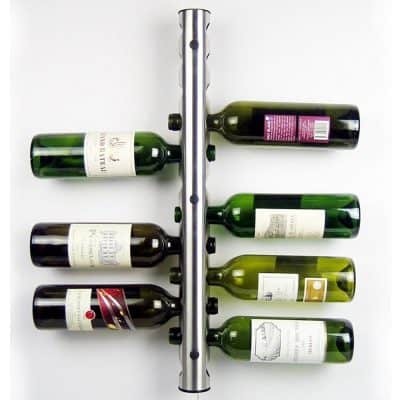 A wall mounted wine rack can store bottles of wine in a horizontal position. 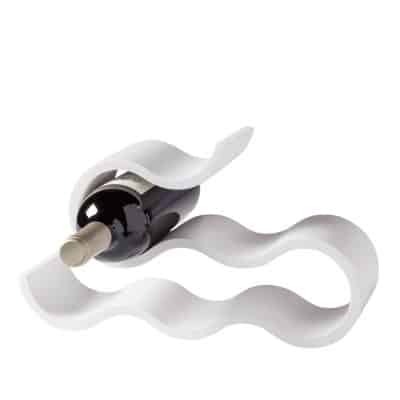 A horizontal position is important because it is likely to keep the cork wet. Wet corks are good because they better seal and preserve the flavors of your wine. 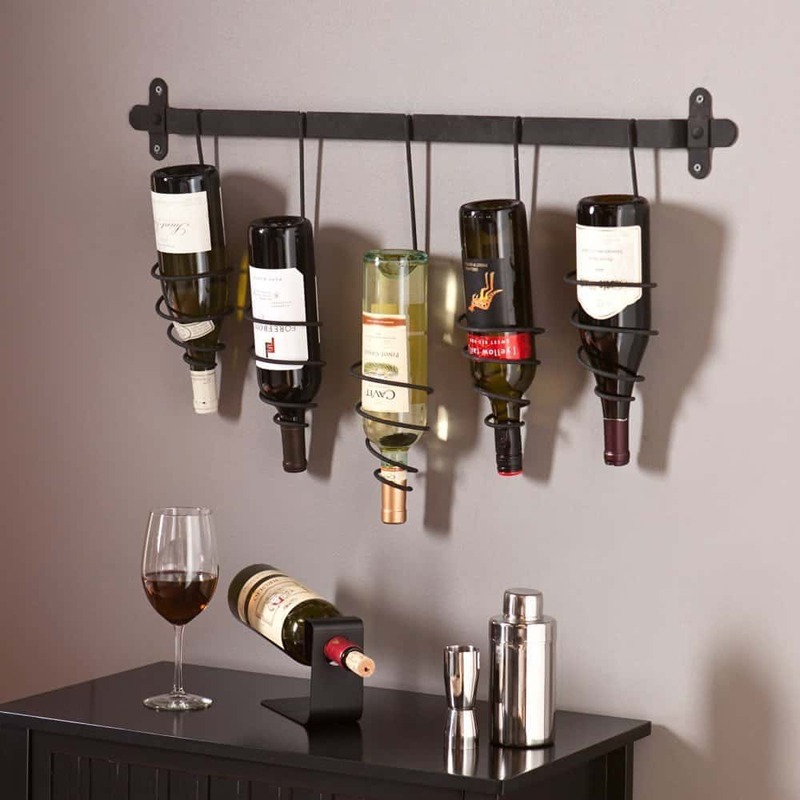 A hanging wall wine rack is usually made out of wood, metal wire, glass or plastic. Some wall racks are simple while some have artistic appearances. 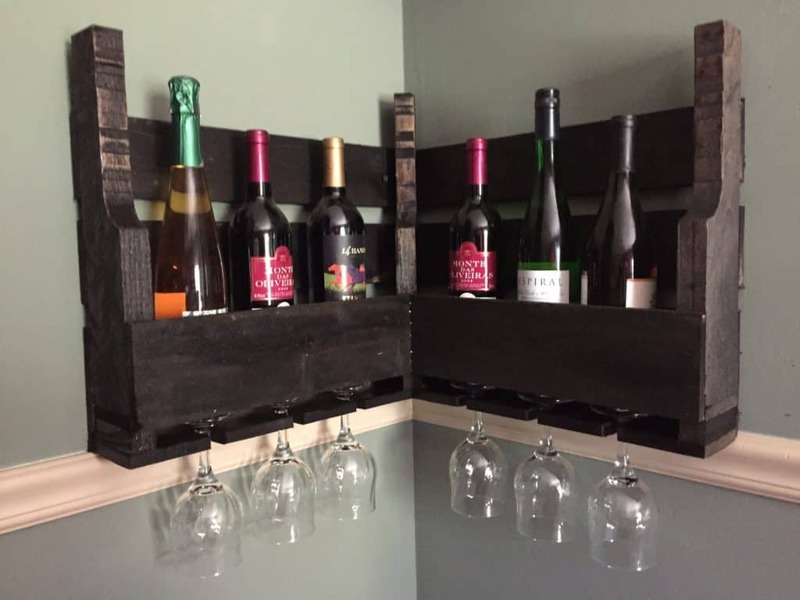 But no matter what the wall rack is made of or what design it has, it needs to be properly installed on your wall to keep your wine bottles safe and secure. 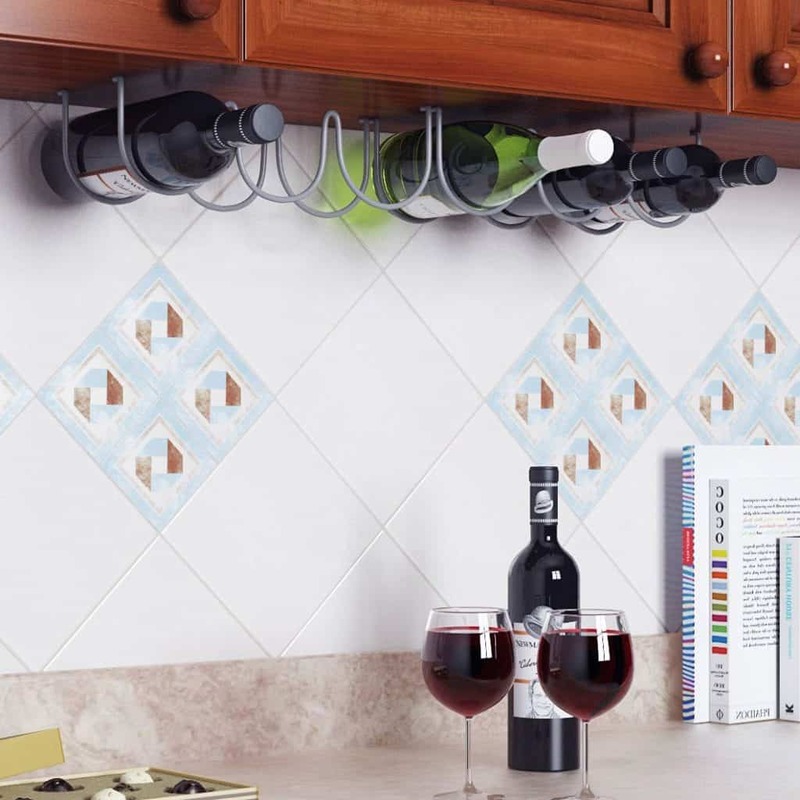 The first thing that you need to do is to decide where to hang your wine rack. 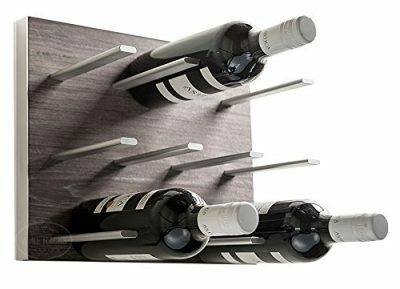 The wall should be strong enough to hold the wine rack as well as the number of wine bottles the rack could hold. When you have decided where to place your hanging wine rack, locate the stud on the wall where you will hang it. A stud finder will help you look for the stud on the wall.If your wine rack uses a single screw bolt, then it should be drilled directly into the stud. If it has multiple bolts, then screw one into a stud and drill the other ones into your drywall to help stabilize your rack. Some hanging wine racks can be hung from the ceiling, so you will need to find a joist (a stud in your ceiling) to mount it securely. After you have located the stud on your wall, use a drill to make a hole through the drywall and into the stud. Then drill the screw into the wall to mount the wine rack.If you don’t have stud or can’t find one, then you can use a toggle bolt to secure the rack to your wall. A toggle bolt has metal sheaths that open like two small wings. These wings help anchor the bolt in place considering that it can hold up to 25 pounds of weight!After you have placed the toggle bolt, place the mounting hardware that came with the wall wine rack. 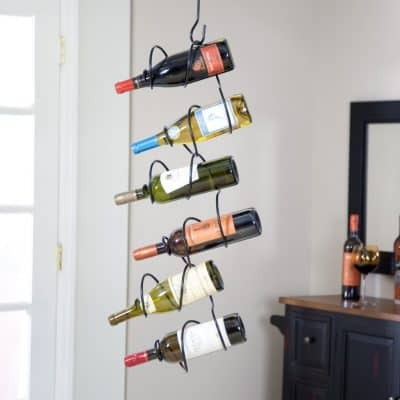 Hang your wine rack in place. 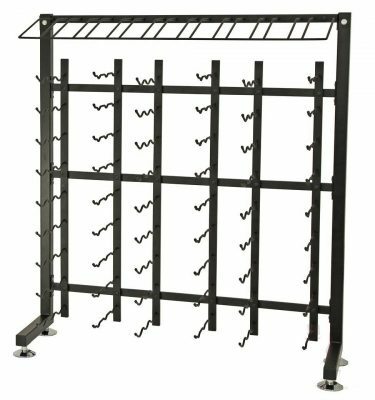 Be sure to follow the maximum weight capacity that the rack can hold to fully take advantage of a hanging wine rack. 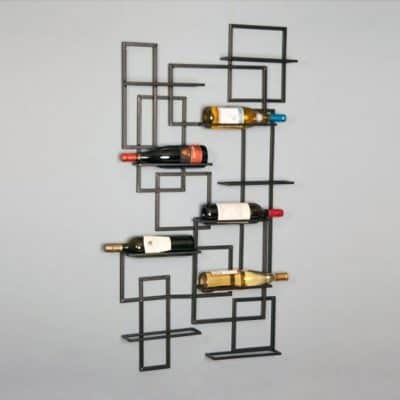 By carefully considering the type of wall, the hardware to use for installation, and the type of wine rack you wish to install, you reduce the risk of damaging your walls and your wine bottles. 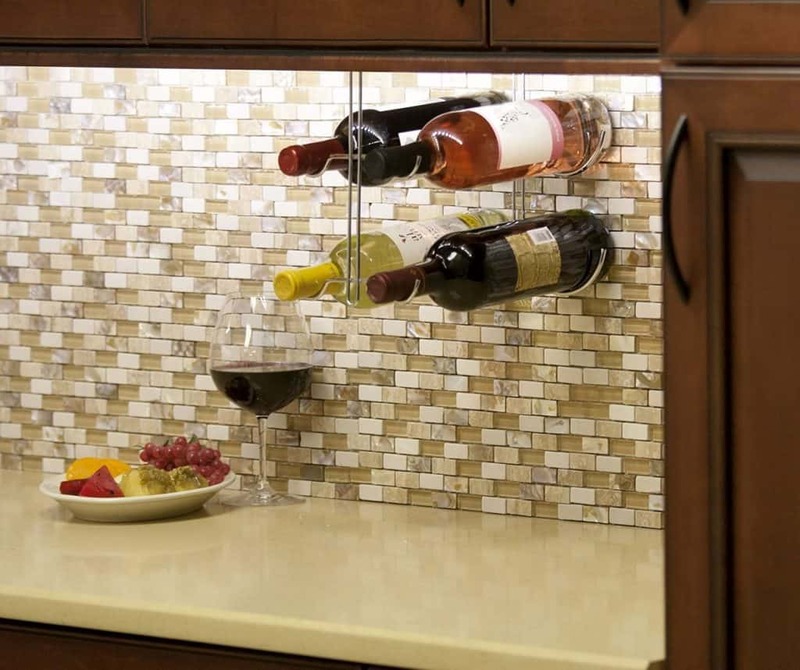 The the best place to mount a wall wine rack is somewhere dark and dry, like in your cellar or pantry. You should choose a countertop wine rack according to the size of your countertop. 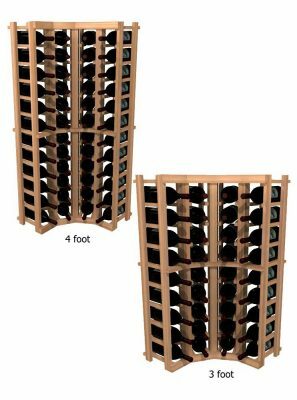 While I like how large wine racks can accommodate more bottles, it can also take too much space that smaller racks won’t. Your kitchen décor also plays a big part when choosing a good wine rack. I would also make sure that I know what kind of wine I have in my possession when buying a wine rack. For instance, if I am going to store vintage wines, I choose a wine rack that will let me store the bottles horizontally so that the cork will not dry out. 1. How much space is available? Whenever I am out shopping for a wine rack for a kitchen countertop, the first thing I think about is how much space I can spare. I usually go out holding a sketch of my kitchen countertop complete with measurements and dimensions. 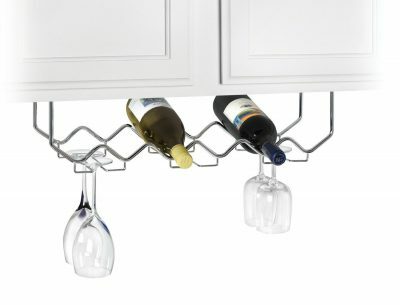 It is not enough to just decide whether I need a small, medium, or large countertop wine rack. At times it is possible to accommodate a medium wine rack but if I don’t have the exact measurements I tend to worry and go for the smaller one instead. 2. How big is the wine collection? 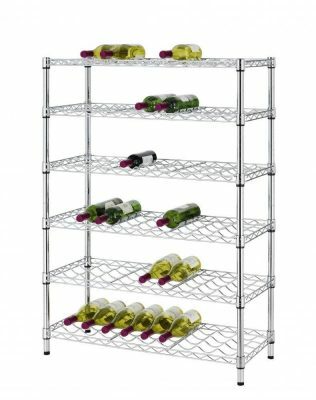 I have a modest wine collection so I also consider how many wine bottles I want to put in the rack. There are wine racks that can hold several bottles while some are made to display a only a couple of bottles. I don’t like the sight of a half empty wine rack. So I have a preference for small wine racks. Choosing a large wine rack is the best choice for serious wine enthusiasts. 3. What’s the current décor theme? 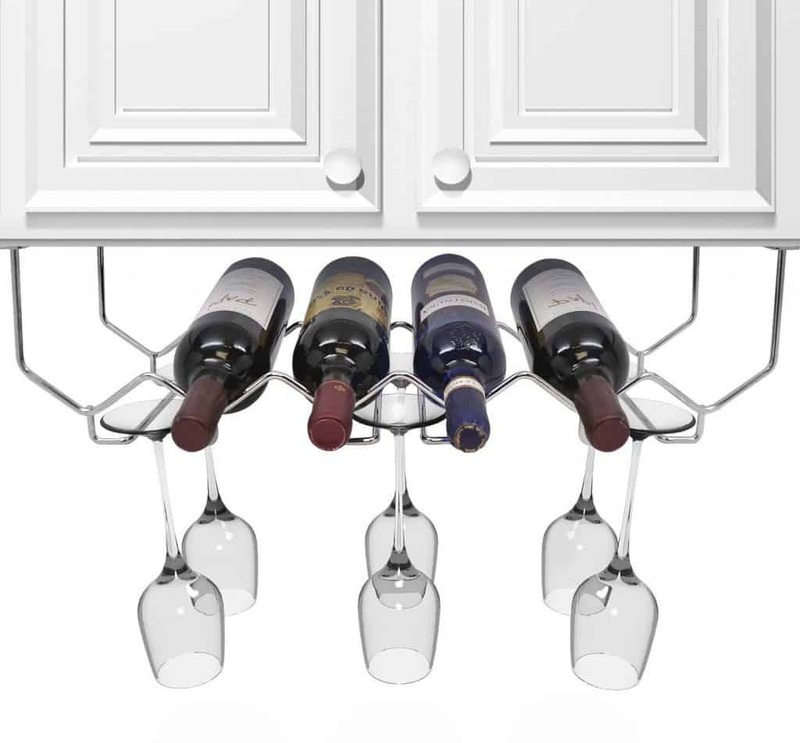 Countertop wine racks are found in various materials that will blend well with any type of home décor. In my modern-contemporary-style kitchen you will find a wooden wine rack on my countertop. It is one of the most attractive features of the room. It catches the eye of every first-time visitor. It does its job really well so I am more than happy about that. 4. What are the priorities? I have seen some beautiful novelty wine racks at the nearby home improvement store. Even though I am all for beauty and aesthetics I still consider function and longevity. I would probably buy one that I can use only during parties and special occasions. These are a few questions I ask myself when looking for a countertop or tabletop wine rack. Answering these truthfully helps me come up with the smartest design choice. My under cabinet wine rack makes my kitchen look elegant and sophisticated. Since I installed a chrome wine glass rack under my kitchen cabinet I stopped worrying about breaking my stemware. It has been one of the problems I was dying to solve. I am glad to be able to do something about it. I stopped storing delicate wine bottles and glasses together with coffee mugs and drinking glasses. I was lucky to find something that was easy to install. I just needed to mount the hardware under the cabinet. 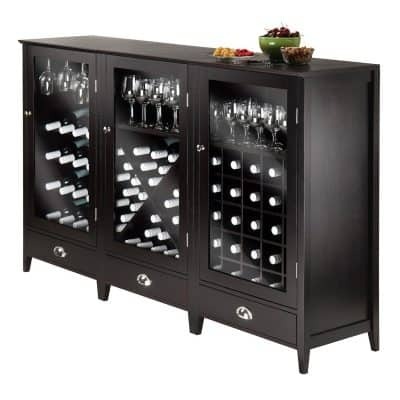 I need a wine cabinet that keeps my wine cool enough for serving. I need it to hold 6 bottles of wine. I need it to be not more than 22”. I need it to be safe and secure. I want it to blend well with my kitchen’s décor. I was lucky to find something that gave me the exact solution to my problem. I found a wine rack that fit perfectly under my kitchen cabinet. I did not have enough space for any wine inside my refrigerator and having the wine rack gives me just the right amount of space without overcrowding my kitchen. It is also way more affordable than purchasing a bigger fridge. It even lets me show off my wine collection and gave me an instant decorative element in my kitchen. I designated an area specifically to serve as a bar between my kitchen and dining room. 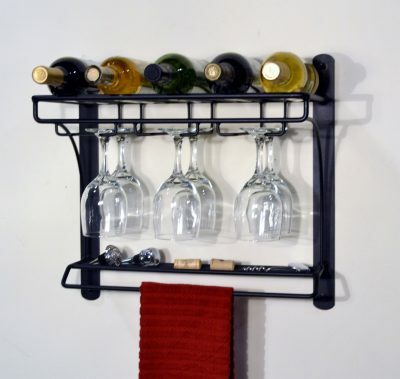 Just like what the picture shows, the wine rack is sturdy and easy to install. There are other wine racks that look really nice and I wish I could have them all in my kitchen. I keep them as inspirations and hopefully I can incorporate them in my own home someday. It gives me great pride whenever guests comment on how I was able to make use of my wine collection as an additional décor in my little home bar. My under cabinet wine rack made it possible even with the lack of space in my humble kitchen. A small wine collection calls for a small wine rack. 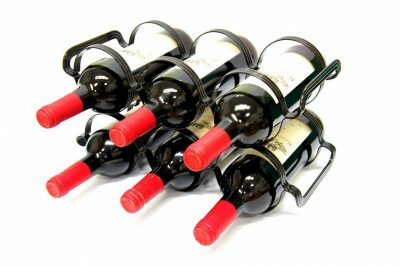 A small rack can hold up to 8 bottles which could either be placed on a countertop or simply hung on a wall or from the ceiling. A small rack can be made of any type of material but the most popular is metal. 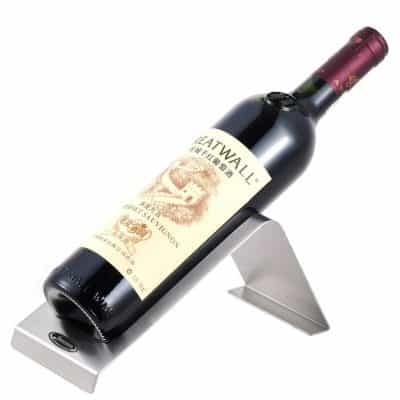 A metal small rack will hold wine bottles securely and will never lose its modern appeal. Here are a few great mini wine rack ideas that can help you when you are shopping for one. 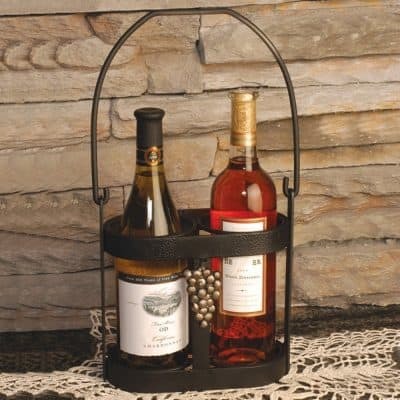 A traditional mini table wine rack is perfect for an evening dinner with guests. This small wine table is as small as a breakfast tray. You can put three wine bottles on the top part of the table. There are grooves on the bottom part of the table to store your wine glasses. 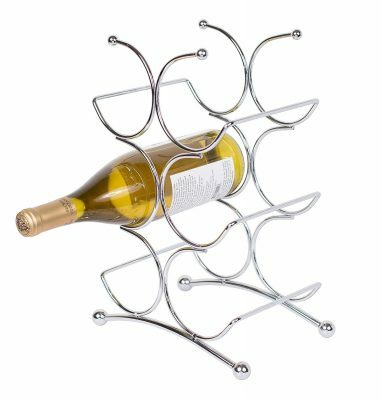 Just put this wine rack on your counter or on the dinner table! This unique wine rack is made of interlocking pieces of plastic which can house 2 bottles of wine. 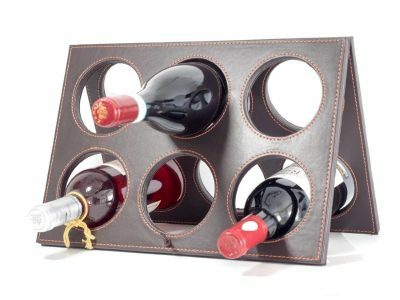 This wine rack is a perfect for in a cabinet, in a refrigerator, or it could sit on a kitchen countertop. 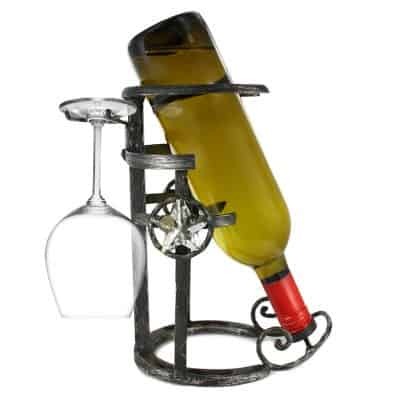 This mini wine holder is just a single piece of metal with grooves to hold 1 wine bottle. 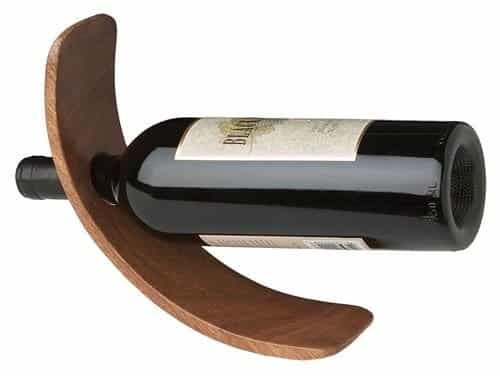 You can take this wine holder anywhere. Put it on your dinner table or on your countertop. It allows you to display your best wine making the wine label easy see. 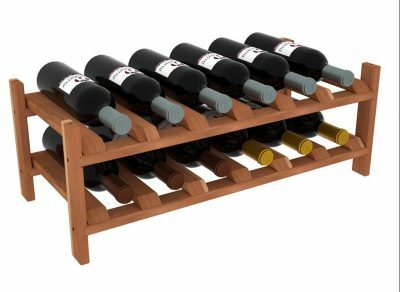 A small rack-like wine rack can work for a beginner collector. 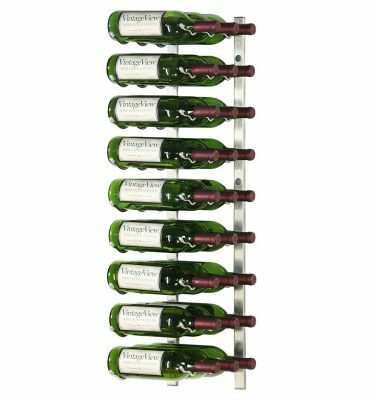 This is a hanging wine rack that can house up to five wine bottles. You can easily check the label of your wines while keeping an eye on your supply too! The bottom part of the rack has grooves for hanging wine glasses too. 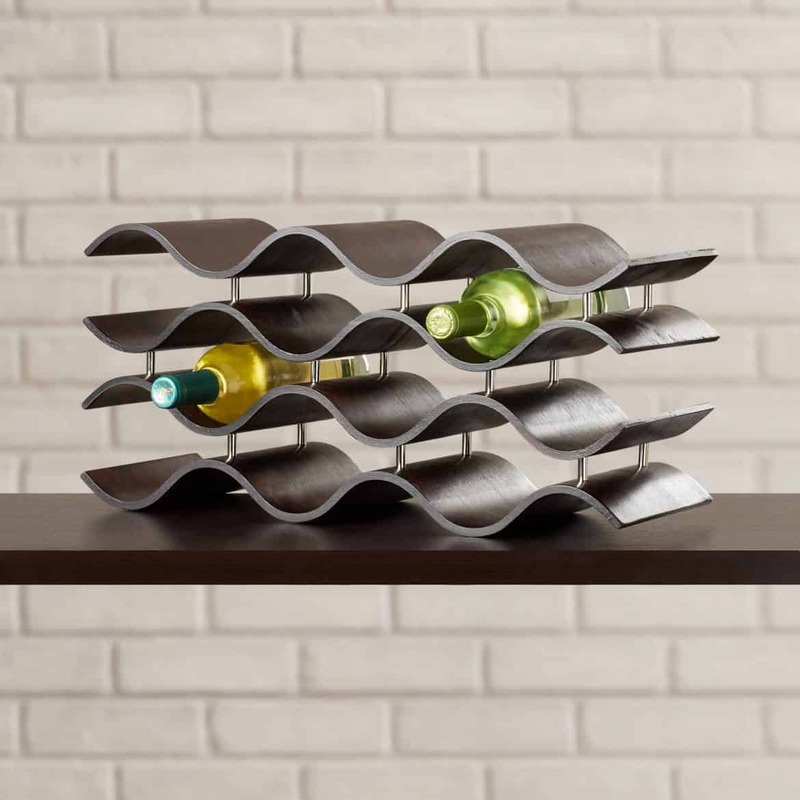 A modern homeowner that’s head over heels with wine will love to use a modern wine rack. A modern rack can be made of anything and could look just like anything too. 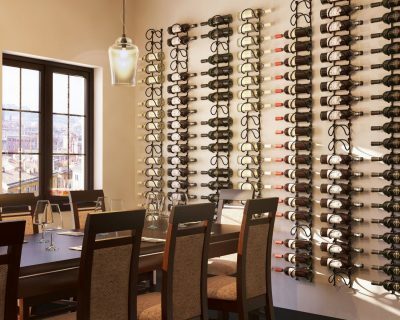 At the top spot is an Epicurean Wine Storage System that has 7 rows and is able to house 91 bottles of wine at a time! 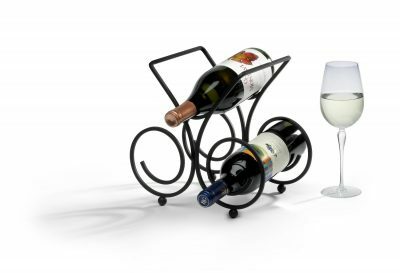 Made of strong and beautiful aluminum, this modern rack has a slim design that would be perfect for a wine connoisseur or someone with a wine business. 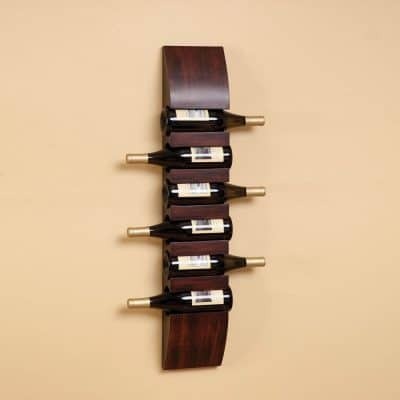 Another great find is the Oenophilia Mid Century Wall Mount Wine Rack. 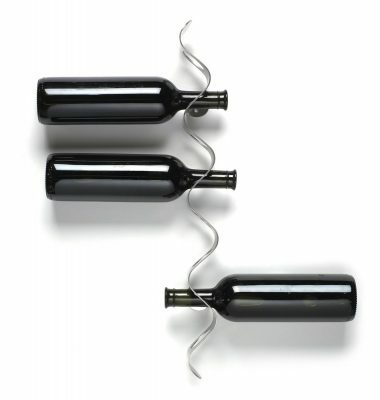 This is a wine pod that can hold up to 10 bottles of wine with its two separate pieces mounted side by side. This wine storage system is modern and very pleasing to the eye with its beautiful modern design scheme. Here is another amazing wine storage solution for a modern home. This modern red flowing wine rack can house 12 bottles at a time. It’s made of hard plastic and metal. This modern piece of art will surely capture your guests attention since it is bold red in color. 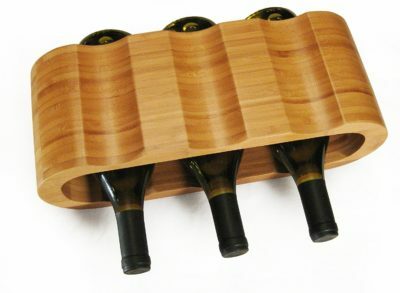 Another modern rack design is a bamboo bottle tabletop wine rack. 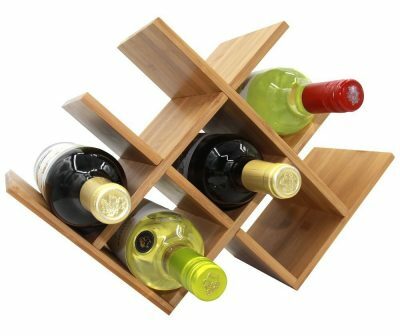 This small wine rack is made from beautiful bamboo. It is easy to carry anywhere. It lets you to store your wine bottles, while still being able to read all of their labels. The design is seamless and very simple to assemble. Some modern racks are also art pieces which are of course sold in a much higher price compared to regular racks. Some wine collectors also collect wine racks. You can start your modern collection today with any of these racks! 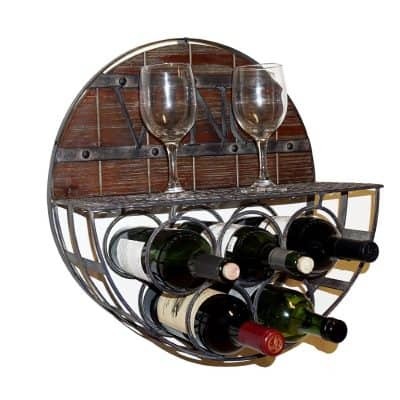 If your home has a rustic country interior décor then you will love the addition of a rustic wine rack. Wine has a certain country feel and almost anything related to wine seems to have a rustic charm. 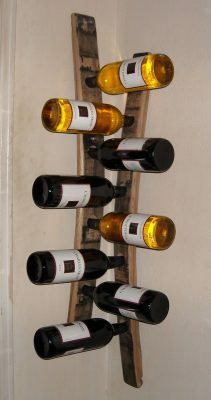 And what better way to display wine than in a rustic horseshoe wine rack? 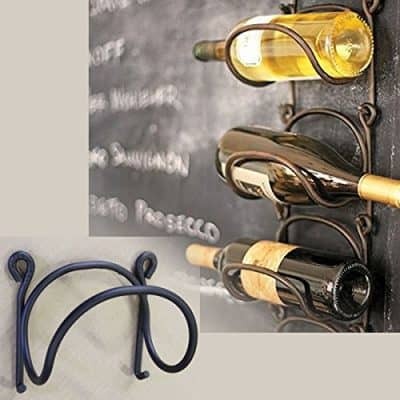 A Horseshoe wine rack is perfect for homes that have a western décor. Horseshoe accessories are mostly rustic as they are usually made with wrought iron. 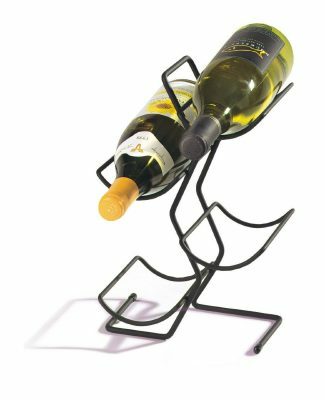 There are stand-alone horseshoe wine racks while some are attached to a stand or a pair of barbed wires to make it sturdier. 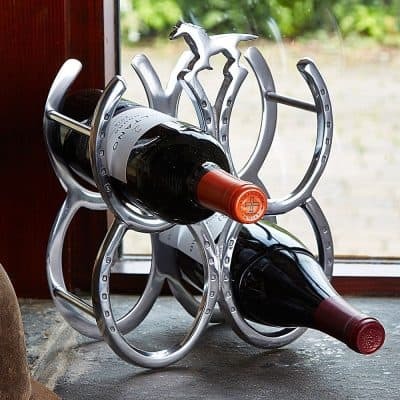 This wine rack and wine glass holder is made of genuine horseshoes. It is charming enough to make any room look as welcoming as a country cottage. If I were to get married in a country wedding I’d pick this as wedding table décor. 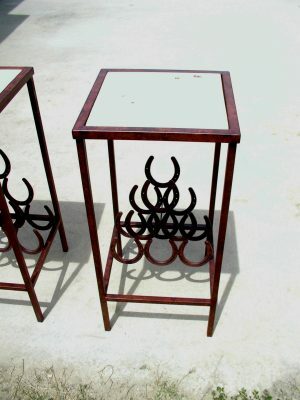 This horseshoe wine rack table makes an authentic accessory in any room with a western décor. It can cradle twelve wine bottles. The table top is made of ceramic tile that provides extra storage or dining space in the kitchen, dining room, or home bar. 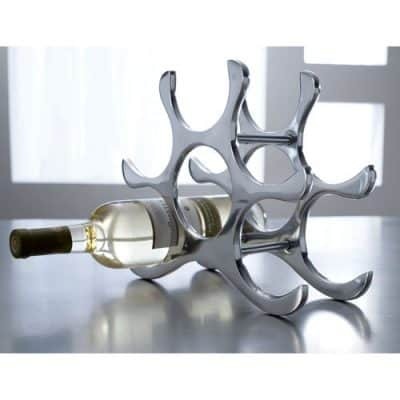 This elegant wine rack is amazing both for contemporary and traditional home décor. It has a V-shape design made with premium quality material for maximum durability. In spite of that, it is still lightweight enough to be carried from any table or bar counter to another. 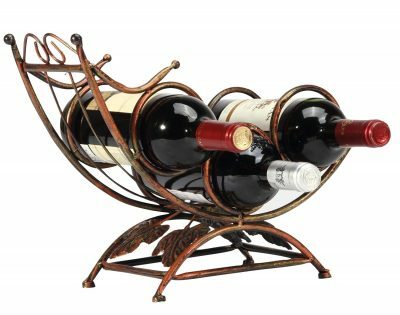 This rustic wine rack features not only a horseshoe but other elements common in the wild wild west including a star and a cross. The stemware holder is removable, making it a versatile décor piece as well as a functional accessory. 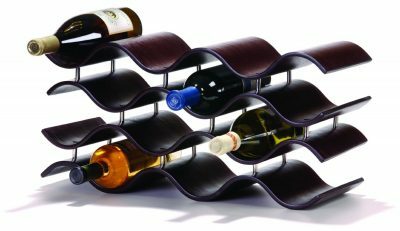 This glossy horseshoe wine rack is perfect for contemporary kitchens or bars. 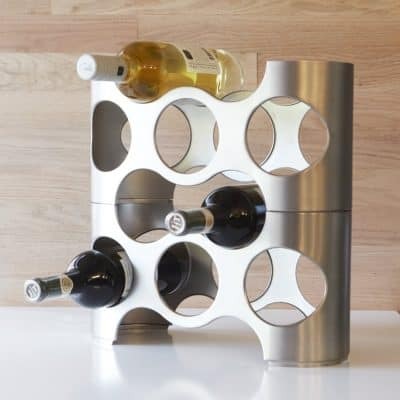 It is made of polished aluminum and can accommodate up to four bottles. The horse trimming suggests that it is intended for riders, cowboys, or people who are fond of horses and ranching. 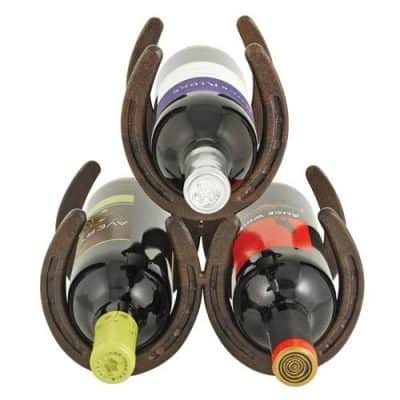 There is no better way to show off beautiful wine bottles than propping them in a cowboy-inspired horseshoe wine rack. They fit easily in homes with rustic décor but would still look great in contemporary homes or country cabins. 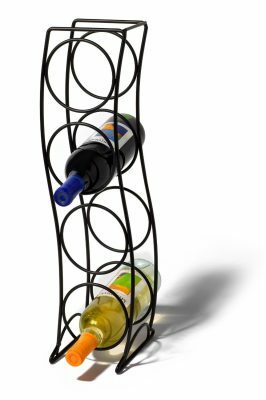 These wine racks are available in different styles and sizes. Side Note: Although these are originally made to hold wine bottles for display and storage, they also look great as bathroom accessories. They can hold towels, tissues, bath sponge, and other knickknacks. A modular wine rack is perfect for my small collection of less than a hundred wine bottles. 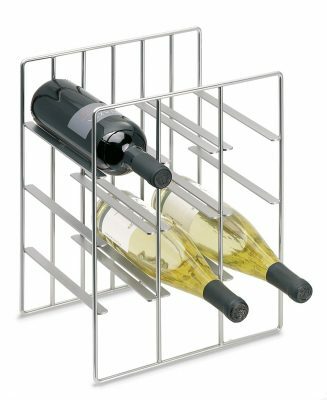 I just want to make sure that the wine rack I choose is something that will hold my wine bottles securely. 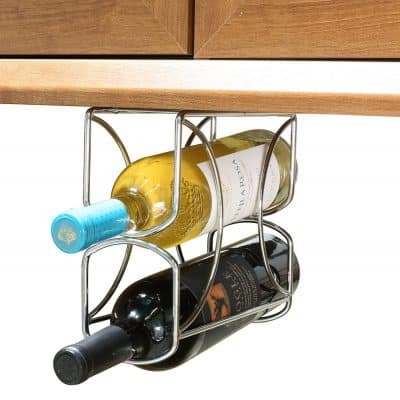 I like this wine rack because it offers a lot of freedom and versatility. I am known by my friends and family to be meticulous when it comes to labeling my collections. I want to be able to find the anything I need right away. 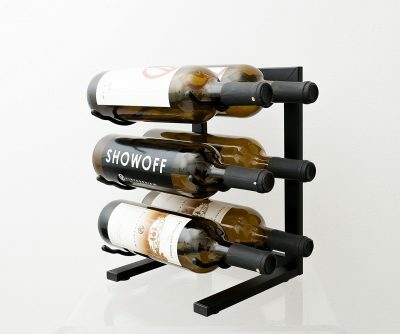 This particular wine rack can be stacked up and set side-by-side. The best thing about this one is that if I ever grow my personal wine collection, I can just buy another cube to accommodate the additional bottles. The built-in bar in this Winsome 70-bottle modular wine rack caught my fancy. It hits two birds with one stone. It adds both a dining and a storage space in my dining room where I plan to display my collection. This one is made by Echelon. Who would not be charmed by the elegance of this modular wine rack? It will surely add an aesthetic appeal to my kitchen. I have seen this being used in one of the bars just a few blocks from my apartment. Another good thing about it is that it looks good whether standing alone or joined together in a cabinet to hold an infinite number of wine bottles. 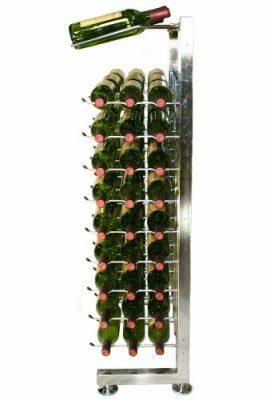 A modular wine rack like the ones I have shown above are perfect for those who wish to grow a collection of wine bottles. This gives us the freedom of buying a layer one at a time or as the collection slowly grows. We can forget worrying about the storage space and enjoy our wines instead! 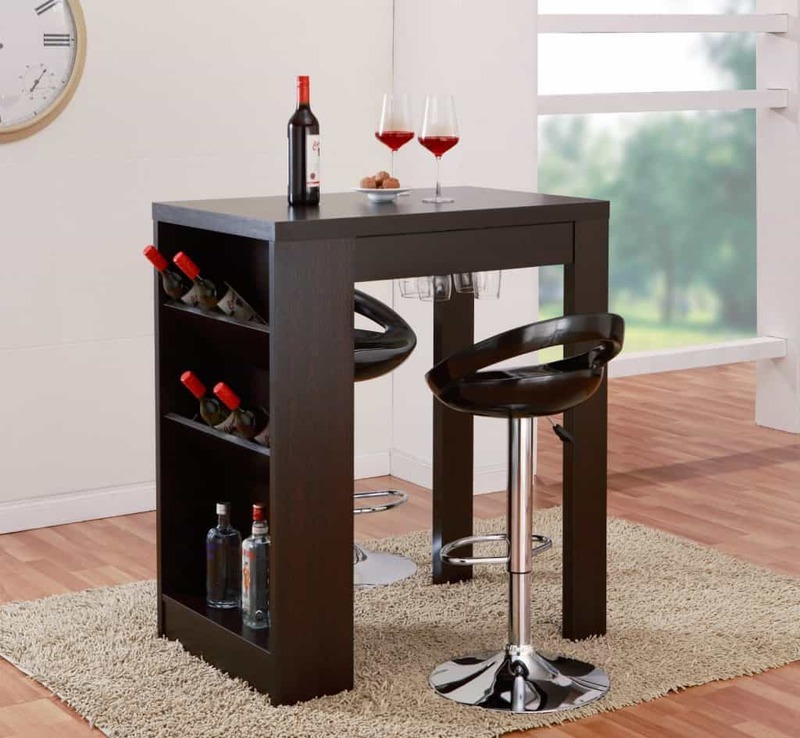 Are you looking for wine rack furniture? Gone are the days when wine is stored in dusty and dingy cellars. Wine is meant to be appreciated, so wine bottles should be kept in beautiful wine racks. Here are some of the most popular designs. Instead of displaying just a few bottles, why not amaze your guests with a 50+ bottle wine rack cabinet? 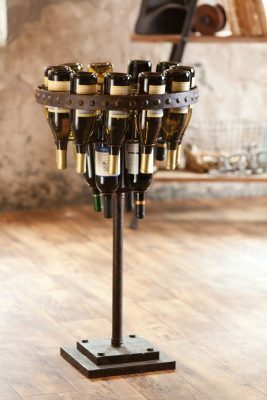 This huge towering wine rack is made of hardwood which can hold enough wine to last a year! Tall racks can be up to 5 or more feet with spacious inverted glass holders on the top of the racks. You can choose from beautiful hardwoods such as oak, mahogany or walnut. If you can have an entertainment, then you can have a wine console too! 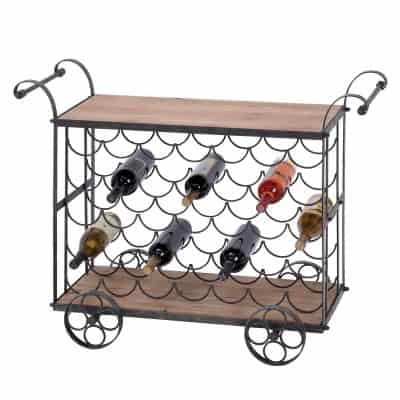 Store as many as a dozen wine bottles in this half circle wine console rack. 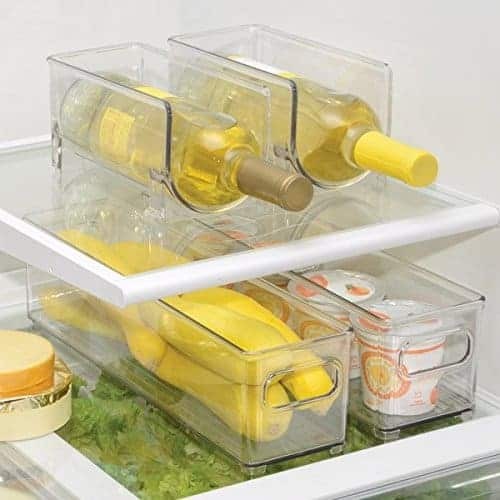 It also has enough space on top for other wine accessories. Made of beautiful hardwood, this piece of furniture will look great in the dining room or in a home office. 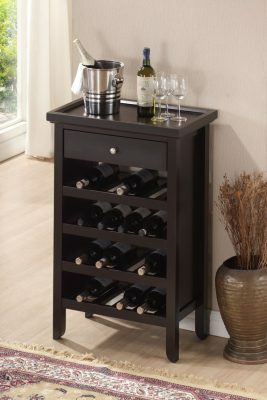 You can find wine console racks made of mahogany, pine or oak. 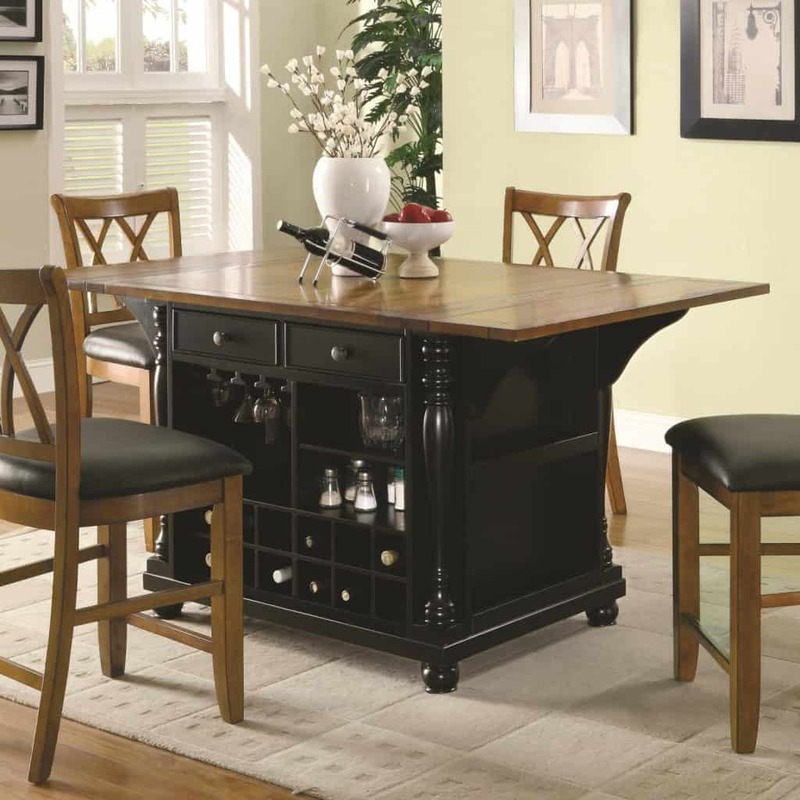 Wine rack furniture such as a wine server sits quietly in your dining area waiting for someone to have a drink. 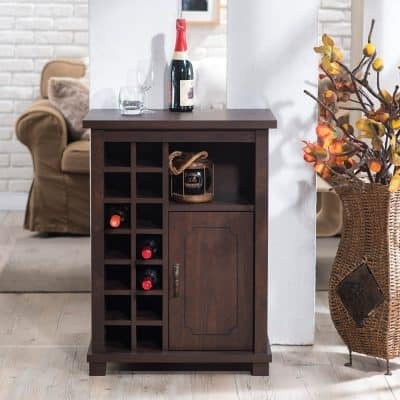 The most common wine server is made of beautiful hardwood with a lot of compartments for storing wine drinking accessories and a wine rack that can hold up to 14 wine bottles. The top part of a wine server has adequate space to put trays, wine glasses and other tableware. If you are looking for a wine rack that can double as a food server then this is a great idea for you. 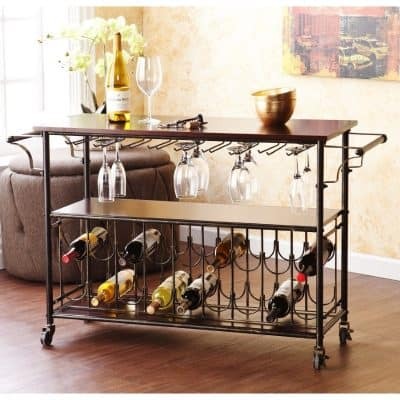 There are so many wine rack furniture designs to choose from. 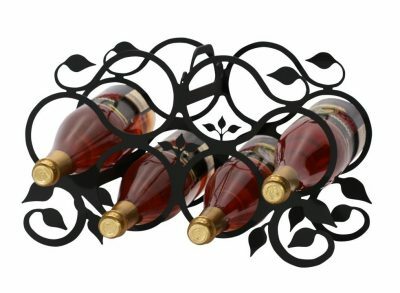 You can find wine racks that match any décor or style. There are also budget wine racks if you don’t want to spend a lot. 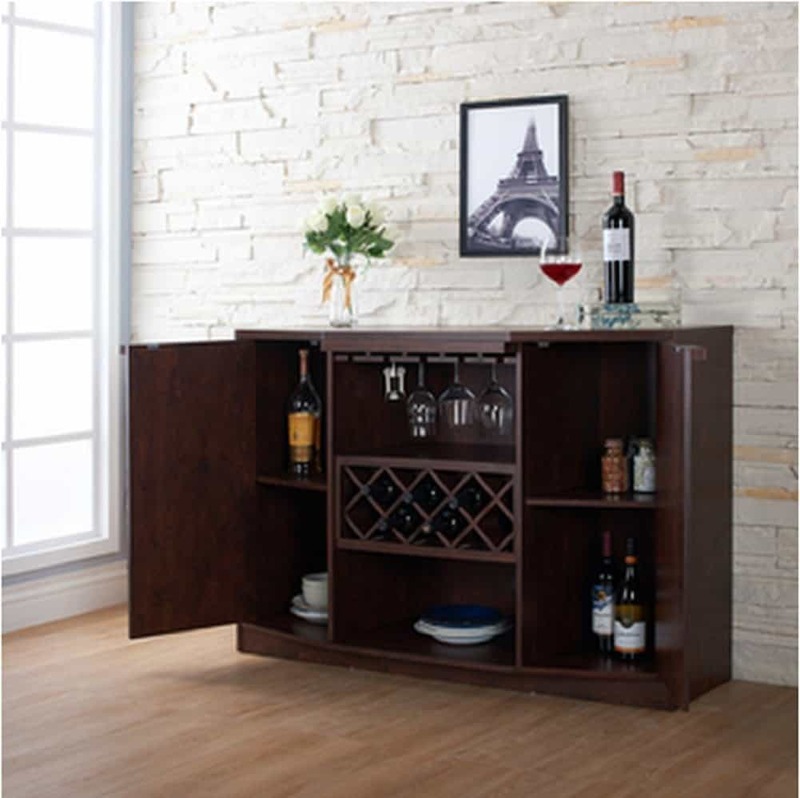 Every wine enthusiast should have furniture to store and display wine at home. Finding a place to store your wine without subjecting it to heat, light, and humidity can be hard if you have limited space in your home. Unfortunately, we’re all not lucky enough to have an abundant quantity of space in our homes, so need to create solutions for storing things. This includes wine bottles. There are many varieties of space-saving wine racks that you can use for tight spaces. 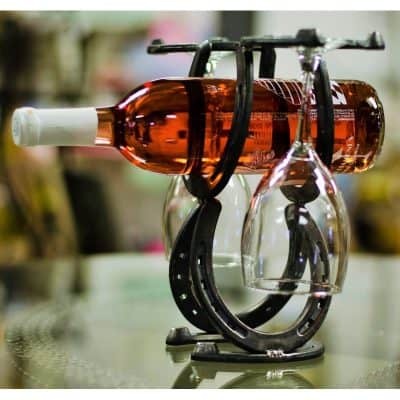 But perhaps you could be a little more clever and add a wine rack to something you already have in your kitchen. 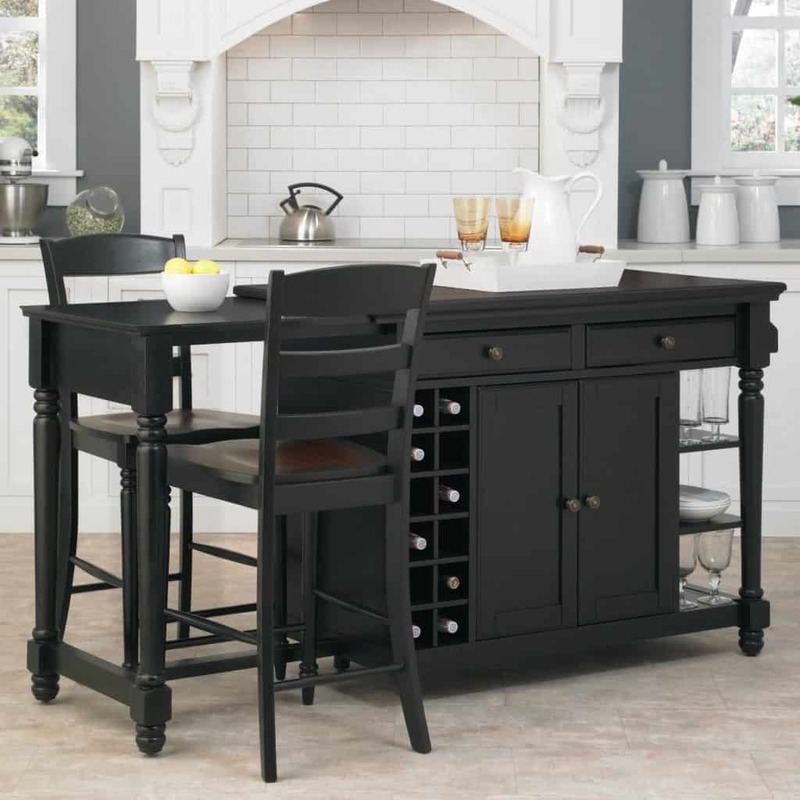 What about a kitchen island with a wine rack? 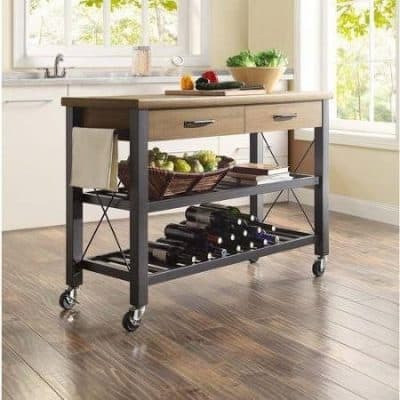 A kitchen island cart with wine rack is an awesome addition for a kitchen. We all know that there are wine racks and there are wine tasting tables, but a wine rack that doubles as a table is the best of both worlds. 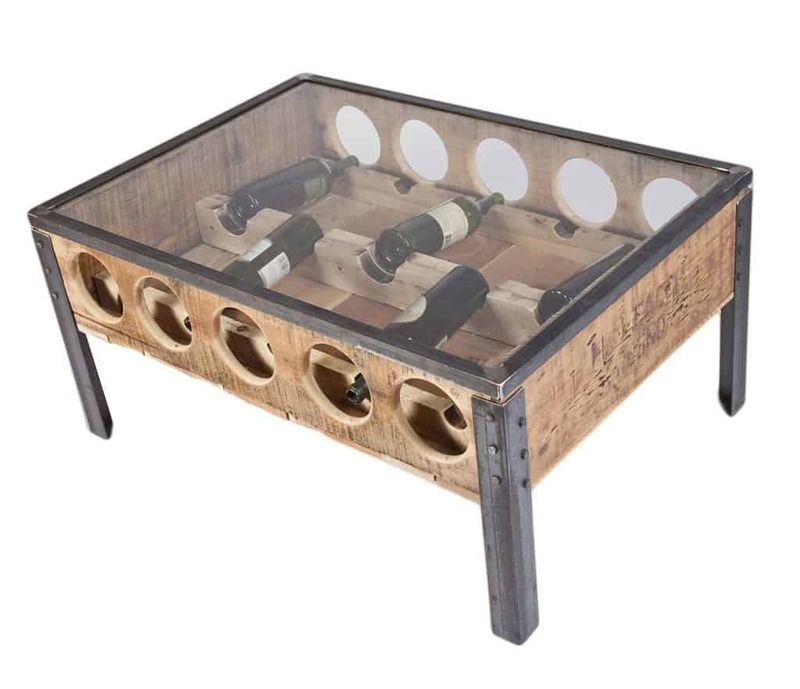 You will be amazed by the many styles of wine racks that double as wine tables! 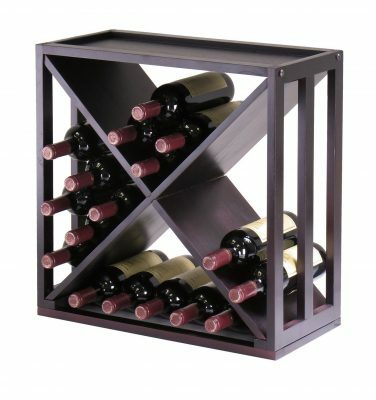 One of the most popular styles is a modular wine rack plus a table that is made of beautiful wood. The wine rack is a three-level rack that could house 18 bottles of wine. The rack has designated grooves to hold the wine bottles securely from the body to the neck. 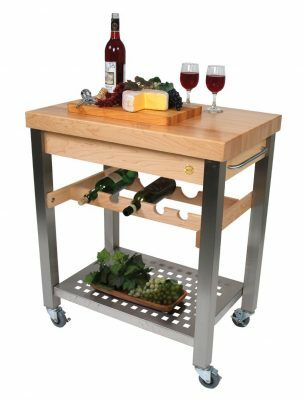 The top of this table is simply a rectangular piece of wood where you can put your wine glasses, aerators, wine bottle openers, wine buckets and snacks for your guests. This is perfect in a dining area or near the living room where you usually entertain guests. 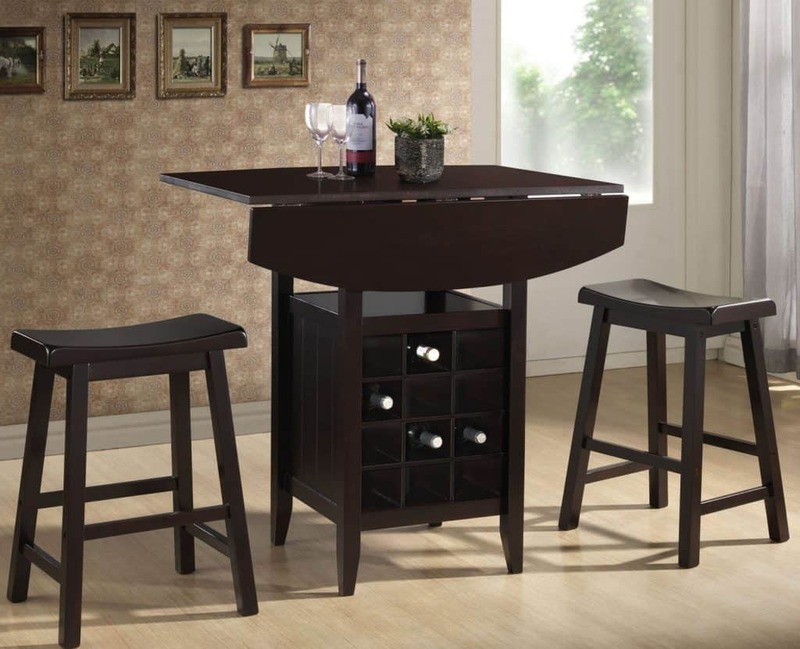 There are wine racks with a table on top that will fit even a small dining area. 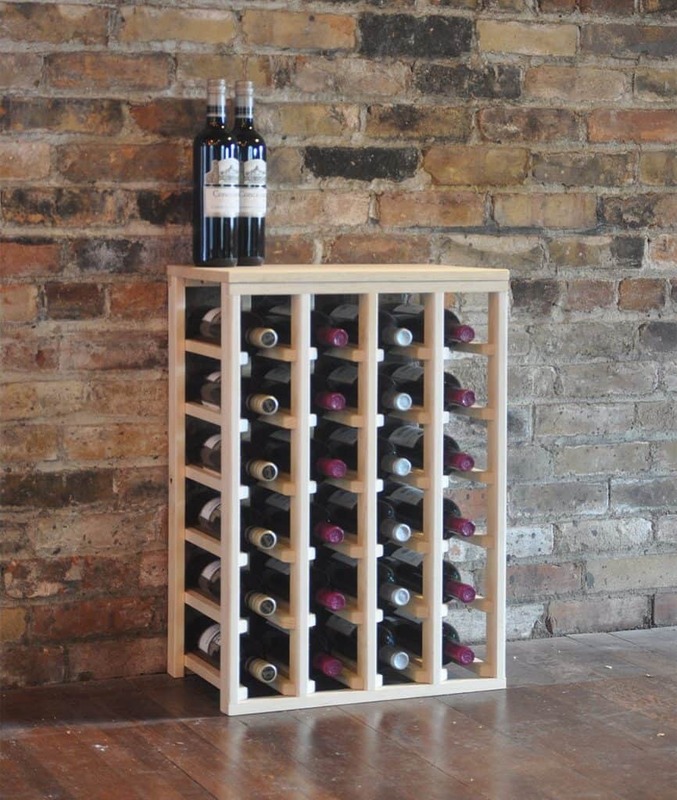 The Baxton wine rack table has wine racks and table made of rubberwood. It’s as slim as the horizontal length of a wine bottle. This table is perfect for a small apartment or even a condo unit. 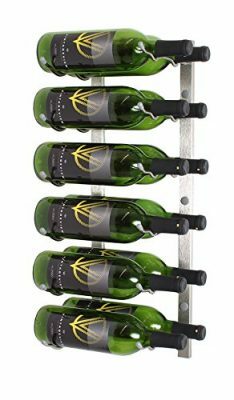 The wire wine rack can hold as many as 12 wine bottles. The middle section has an area where wine glasses and other accessories can be stored. This leaves the tabletop area free to place decorations for your living or dining area. A metal/wooden wine rack that doubles as a buffet console table is a great furniture piece that will totally enhance any dining area. 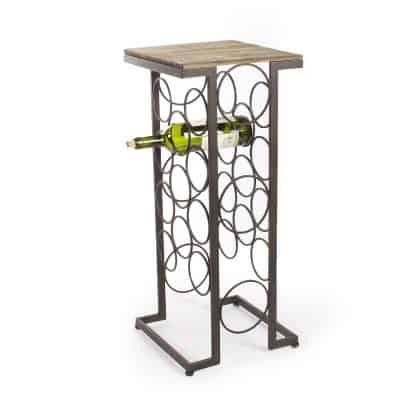 This wine rack table is made from strong hardwood and has a metal frame. There is a wine rack in the middle of the table that houses 16 bottles of wine and the bottom portion of the table has a place where tableware can be stored. The top is a beautiful piece where you can place food and other wine tasting and drinking accessories. 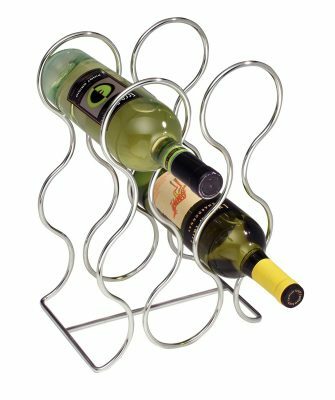 A corner wine rack is a rack that sits comfortably in a corner. Here is a corner wine cabinet made from beautiful hardwood. The wine rack is at the front of the cabinet and could house up to 8 bottles on top and 8 bottles on the bottom part. Both sides of the cabinet open to reveal more places to store wine accessories and more wine bottles. The design is simple. The rack looks like a corner table but has several levels where the bottles are held securely in small grooves. The bottles are held from the body to the neck. They are easy to store and easy to remove. There are spaces where you can put wine glasses, aerators, and wine openers. This fits a standard 90-degree corner and is perfect for a rustic or modern dining area. 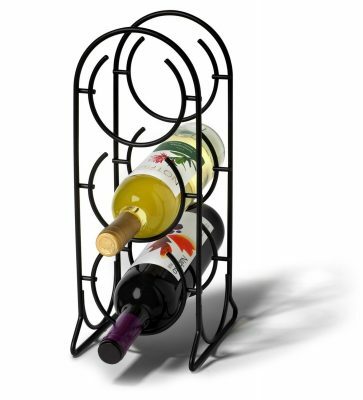 Here is a special wine rack that will fit a corner. 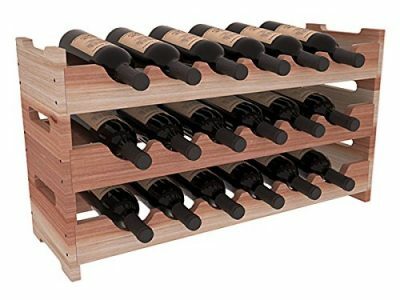 This multi-level wine rack can hold more than 36 bottles of wine and is made from beautiful and strong hardwood. 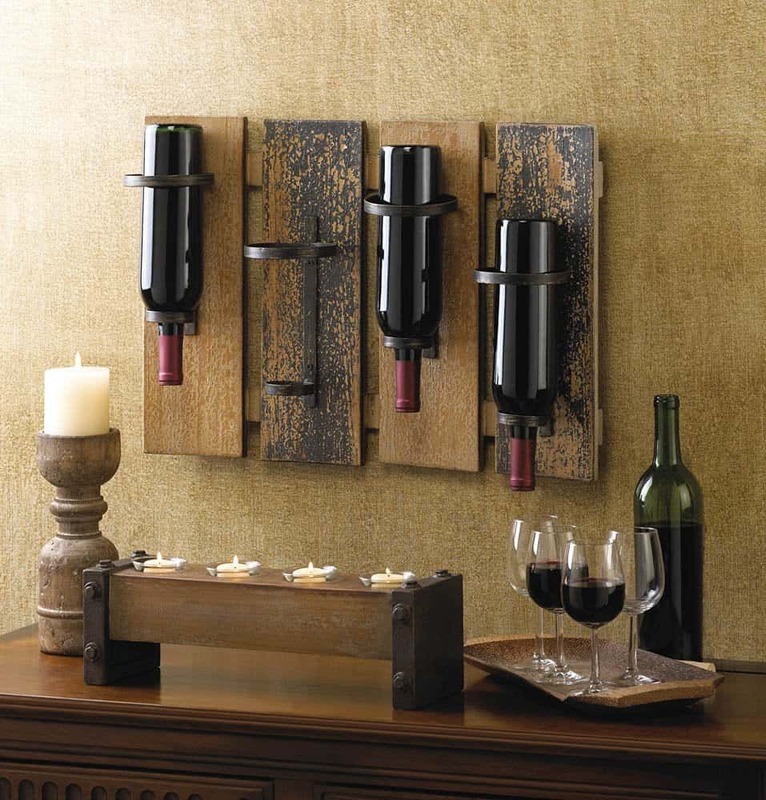 Slender and sweet wine racks that house quite a few bottles will look great in a small corner. This type of rack will be able to hold 20 bottles of wine. This is definitely a rustic wine rack that will fit a country style home interior. Corners can be deceiving and they aren’t always perfect 90-degree angles. If you have an unusual corner then you should hire a contractor build you a custom corner wine rack. Consider the number of bottles you wish to store as well as the interior design of your home. 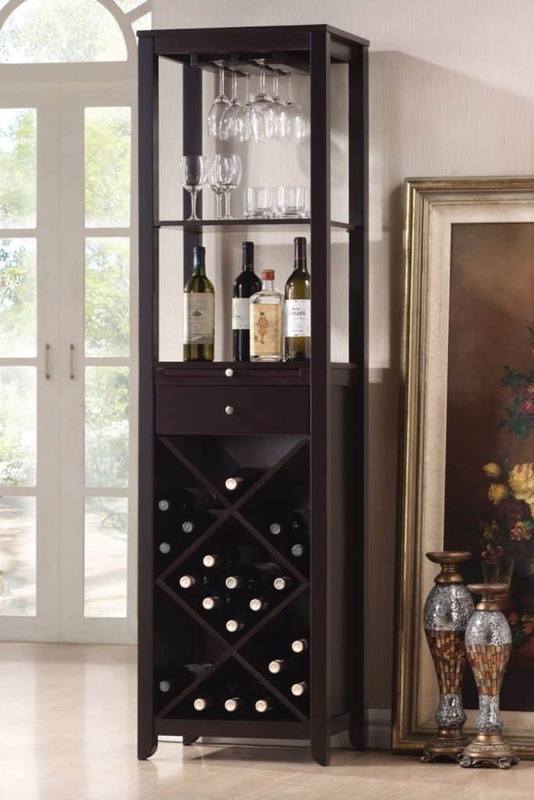 You will get the exact corner wine rack you need if you have it personally made. I underestimated the fun that comes with wine collecting. I started with less than ten bottles but my collection has now grown. I need more storage for them. I believe that wine collecting can only be enjoyed if you know how to store the bottles properly. Wow, this turned out to be HUGE post and took over 2 weeks to put it all together. I hope it helps you choose a wine rack! 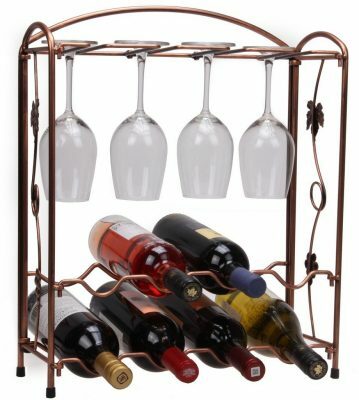 I’ve been looking at all sorts of different small wine racks to help us have some space in our apartment, but I haven’t found the right one yet. 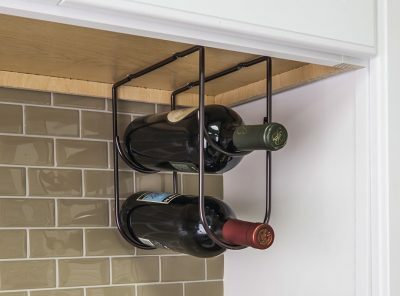 I really like a lot of the slim and modern design wine racks that you talked about in your article, and I would love to see if there are smaller options available in a few of them! 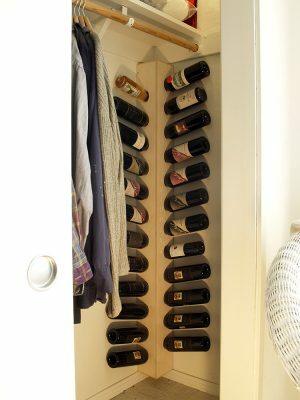 Thanks for putting this all together, and giving me a better idea of what I want from my small wine racks! Thank you for featuring our ‘Z’ Style wine rack. Love ALL your selections! No problem, I love the look of this rack!